The Atlanta Hawks have hired Van Wagner Sports & Entertainment as a sales consultant for new premium seats tied to the $193 million renovation of Philips Arena. Van Wagner’s Evan Gitomer is the project director. He is leading a team of 10 Hawks sales representatives selling two new suite products in addition to loge boxes and party suites marketed as cabanas, said Kyle Brunson, the team’s senior vice president of ticket sales and service. Gitomer, whose premium sales experience includes stints with the Orlando Magic and the old Kansas City Wizards, knows the Atlanta market well. Over the past 2 1/2 years, he led Van Wagner’s effort to sell 32 suites and about 3,200 club seats for SunTrust Park, which the Atlanta Braves opened in March. In Cobb County, Van Wagner filled a deeper role as the Braves’ sales agency. Several Van Wagner employees sold premium seats at the team’s preview center across the street from the ballpark. In downtown Atlanta,Gitomer alone will be embedded with the Hawks’ sales team at a preview center whose location has yet to be determined, Brunson said. Gitomer will work with Brunson and Andrew Saltzman, the Hawks’ executive vice president and chief revenue officer, to supervise the sales staff. The new inventory revolves around a redistribution of premium seats at the 18-year-old facility. When it opened in 1999, Philips Arena’s suites and club seats were all situated on the building’s west side, a feature unique among NBA and NHL venues. But over time, the suite wall model became outdated, creating a negative image over what some perceived to be a separation between the “haves” and “have nots” in the arena, and many suites became vacant after long-term agreements expired, project officials said. 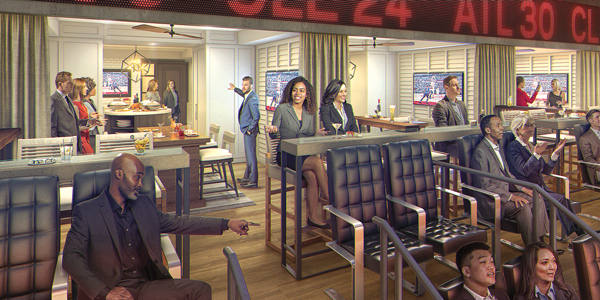 As part of the arena’s reconfiguration, the two levels of existing suites closest to the court are being converted to 20 Veranda and 21 Loft suites, respectively, redesigned to encourage greater interaction and an improved social experience over the traditional suite model. The final mix of concert loge boxes, situated opposite stage end, and the cabanas is to be determined, officials said. The same is true for the pricing of all the new premium inventory. Construction on the upgrades began this past summer. Work will continue through the season and is scheduled to be completed by next October, in time for the 2018-19 season.